So there you are, an independent filmmaker at a top film festival. Your movie is received well, gets some good buzz, but it’s six months before you secure distribution. You’re ready to release, but remember all those people eager to watch the movie six months ago? They’ve gone on to something else. The point is that independent filmmakers have a tough time with marketing and promotion; they don’t have the resources or tools to expand their outreach. Only the big Hollywood studios have the resources to drive enough cross-platform advertising to stir up buzz over their upcoming blockbusters, six months in advance. And, it goes without saying that this isn’t just limited to independent filmmakers, it’s true for musicians, artists, and many more. That’s why early ThePoint/Groupon employee Shawn Bercuson, Zoosk Co-founder John Smart, Dan Rummel, Lee Wilson, and Tyler Seymour launched Prescreen last September – to bring movie lovers an easy way to discover independent films they wouldn’t otherwise and, in turn, give filmmakers, producers, and more a shot at drumming up interest in (and bringing eyeballs to) their work. 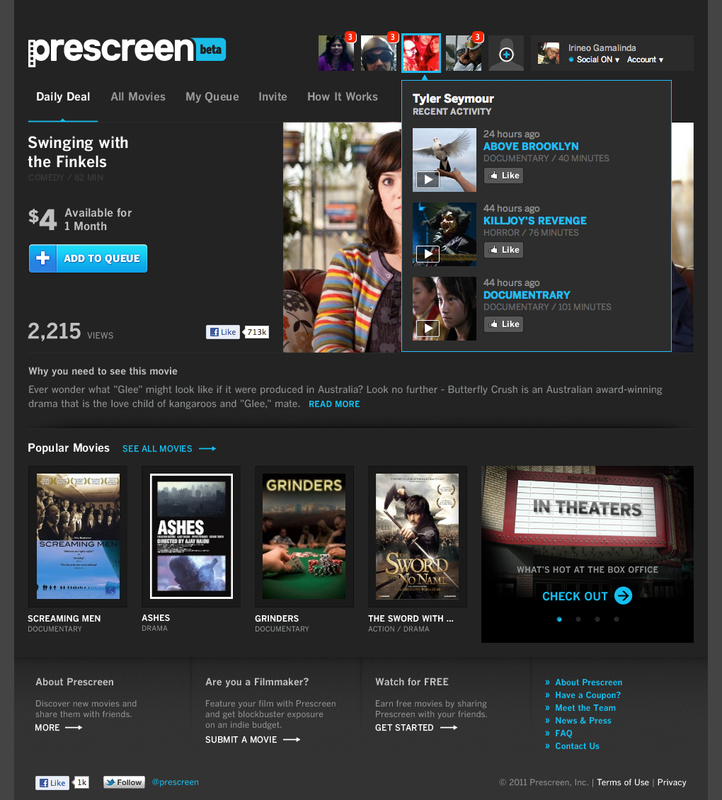 Prescreen aims to provide independent filmmakers with an alternative to traditional advertising and marketing channels with an on-demand platform that borrows a page from Groupon, serving users with daily emails that feature a particular film that it thinks will strike their fancy. Users can watch trailers of a wide range of movies for free, discovering new, curated content, and then purchase the content they want to watch, streaming it on-demand for up to 60 days. Today, Prescreen is getting a makeover in an attempt to boost its social credentials, relaunching with a new social movie discovery experience that features Facebook Open Graph integration. While Prescreen initially targeted independent films, Bercuson tells us that the team doesn’t want to limit Prescreen content just to movies; instead, they’re going after all long-form content, and will begin to add indie-ish stand-up comedy specials, concerts, larger budget movies, and more. Prescreen aims to continue supporting indie movies, focusing on premium content – a more targeted, socially crowdsourced version of Netflix. In the new Prescreen, users sign up for free through Facebook Connect to watch free trailers and can bookmark new content with its “add to queue” button (something with which both Netflix and users of the awesome Watch It service will be familiar with) before going on to rent on-demand. And what good would having an early Groupon employee be without offering users the chance to earn rewards and discounts by sharing movies with their friends? Prescreen continues to offer social sharing discounts, as well as daily deal-type offerings when new titles are introduced on the site. With the new Facebook integration, users can now have viewed trailers or queued movies pop up in their Facebook timeline or news feed, and, if their Facebook friends have signed up, users can also view what their friends are watching. Again, it probably now goes without saying, but everyone’s on Facebook – even your cat – and social proof, or influence, has proven to be an effective way to discover new content, travel destinations, music, clothes, etc. that is relevant to you personally. The idea being, who knows you better than your friends? And whose recommendations do you trust more than a close friend, or loved one? A stranger?! Don’t be ridiculous! Not in the Facebook Era. Thus, allowing users to see what their friends are watching helps them discover titles that are relevant to them, but it’s also a great, organic way for content producers to turn up the buzz on their work. Good old-fashioned word-of-mouth marketing, viral-social-graph-style. As to monetization, beyond taking a cut of on-demand sales (the rest goes directly to the content owner), Prescreen also provides content producers with analytics and demographic info related to their content, allowing them to better target their marketing efforts. Those who offer their content exclusively to Prescreen get that stuff for free, and those who are already sharing their content on other sites pay a fee. Prescreen’s model definitely capitalizes on a growing trend among artists, which is to bypass traditional deals with big media, (like going to HBO for a comedian), and offer their content on their own site for a price they choose. This obviously also means they don’t have to deal with profit-sharing. Prescreen could become a go-to resource for artists that want to avoid contracts, losing control of their content and so on. The CEO also tells us that not only are they planning to build a dashboard for content producers (to view analytics, etc. ), but they want to expand the role of content curation on the site by bringing in, say, a famous director, who gets to feature his or her favorite indie horror films for a week. This seems like a no-brainer, as it could be a big draw for viewers, and fun for the notables. Obviously, the startup wants to take advantage of the multi-billion dollar industry that is entertainment marketing. Bercuson believes that by offering Facebook integration for viral sharing and by working with content producers to place ads on the site and giving them access to views, demographics, it will be able to boost conversion and get a leg-up on Hollywood, which is still stuck in those CPM models. At least that’s the hope. By tracking views on trailers, and then comparing that to what viewers actually watch, the company will start to get a better sense of how the two correlate – how much/often intent (watching trailers) leads to making a purchase. That’s the key. They can then tweak discounts, flash deals, etc. accordingly, and marketers start to know how best to target, and when. The startup has raised $1 million in seed financing to date, from the likes of Former Facebook VP Chamath Palihapitiya, Ed Cluss, Auren Hoffman of Rapleaf, Saad Khan of CMEA Capital, and Bercuson himself. They’re also in the process of attempting to build out their advisory board with industry veterans, and already have Blockbuster exec Tim Wesley and IM Global Founder Stewart Ford. 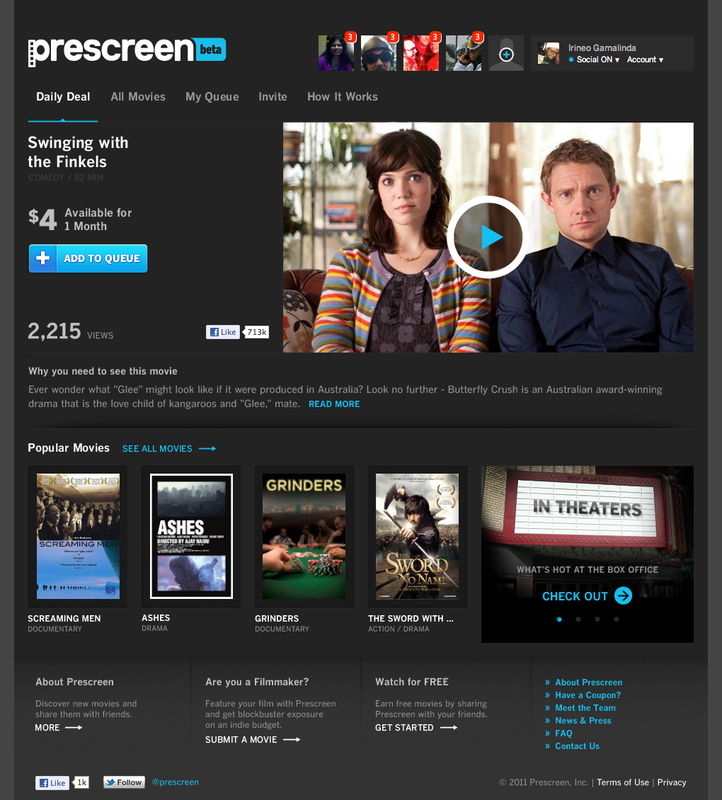 For more on Prescreen, check them out at home here. And let us know what you think in the comments.